The Silver Throne (Swedish: Silvertronen or Drottning Kristinas silvertron) is a throne which has been used by the Swedish monarch at coronations, accessions to the throne and state opening of the parliament. 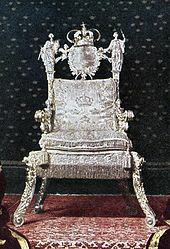 The Silver Throne is located in the Hall of State at Stockholm Palace. The Silver Throne was made for Queen Christina's coronation in 1650. Crafted by Abraham Drentwett in Augsburg, Bavaria, it was a gift from Count Magnus Gabriel De la Gardie. It was last used in 1975. ^ Heymowski, Andreas. "Den mäktiga rikssalen" [The magnificent Hall of State] (PDF). www.sfv.se (in Swedish). The National Property Board of Sweden. Archived from the original (PDF) on 8 December 2014. Retrieved 4 December 2014. ^ "The Hall of State". www.kungahuset.se. The Royal Court of Sweden. Retrieved 4 December 2014. ^ Åse, Cecilia (2009). Monarkins makt: nationell gemenskap i svensk demokrati. Ordfront. p. 9. ISBN 978-91-7441-365-6.